As most of you know, I am very resourceful but every now and then you have to splurge. This is a DIY “splurge” (if you will) and my most favorite spot to display my boys’ artwork. I love my boys’ creativity. Their pieces of art. I love the excitement on their beautiful faces when they’re showing me what they made. I love displaying their artwork, but I don’t love chaos and pictures taped to the walls and plastering the refrigerator. So I had to come up with something classy, something easy to change out pieces of artwork on, something the boys would feel special to have their art displayed on, and have it somewhere on the main level of our home (which has limited wall space other than really long walls). One day while shopping in IKEA, I found something interesting… curtain wire with coordinating small metal clips. I immediately started brainstorming. What could I do with this set? It seemed like such a good creative DIY tool and this could be great to show off the boys’ art. But… I didn’t want it attached to my wall and I didn’t want just a single row of artwork. And then the idea hit me that I could use this in a frame! I have to be honest, my wonderful hubby did this DIY project for me under my “advising”. Some of the frames may be difficult to screw/staple into so you may want to have another set of hands to help you. Decide on spacing of wires. Remember that the clips will hang down. I wanted a couple inches between the frame and the top wire, but forgot about the space between the wire and the clip. My suggestion: do only about an inch between the frame and top wire. Mark for placement of the eyelet screws. Hubby pre-drilled them to make it less likely to split the wood of the frame and to ensure the screws go in straight. Route the wire and pull it reasonably tight. After all wire is routed, crease the corners. Using pliers to crease the corners, will loosen the wire and give additional length. So, work from the middle of the wire to each end or from one end of the wire to the other. In other words, crease one corner, then pull the wire tight before creasing another corner. Attach picture hangers. 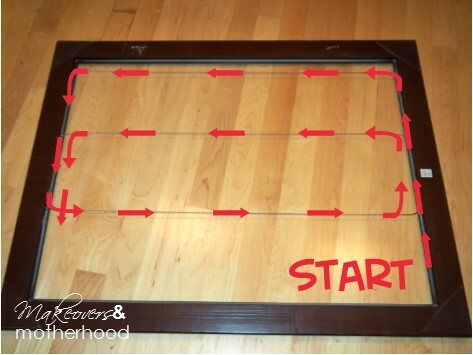 Most large frames will need picture hangers added to them. (We used 2 saw-tooth hangers.) Start by finding the studs in the wall. Decide where on the wall you are going to hang your frame. Mark the studs accordingly on the frame. (This will hold the frame securely on the wall. We don’t want the weight of the frame to tear the drywall.) Attach hangers according to directions on back of package. Now comes the fun part… DECORATE! Let your little ones help you! 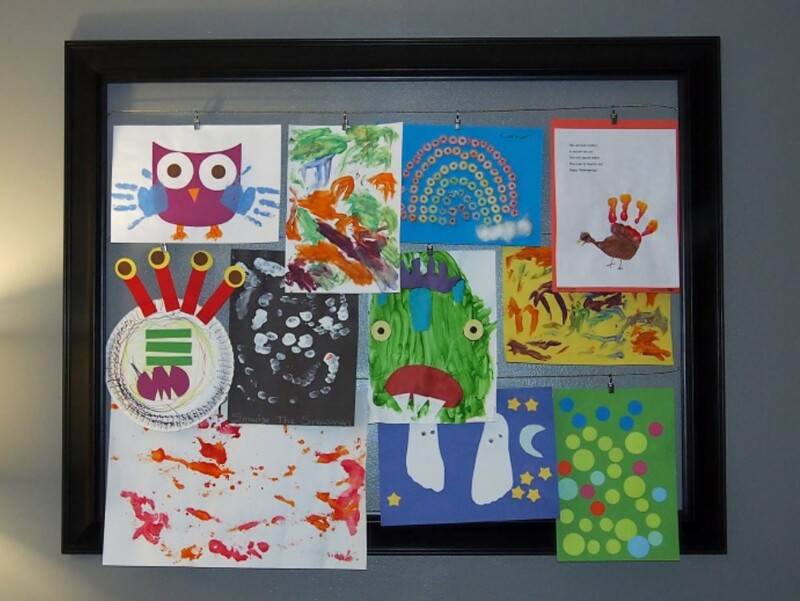 Pick out their favorite pieces of art and have fun making a beautiful artwork wall collage! I hope you love you and your little ones love your new art display! How creative! Love how it looks too! Thanks for sharing with Afterschool! Great idea! I stopped by from Cropped Stories. Found you on Mommy Moments blog hop. I love this idea. My son is only 15 months but I can’t wait for him to start making things I can hang. 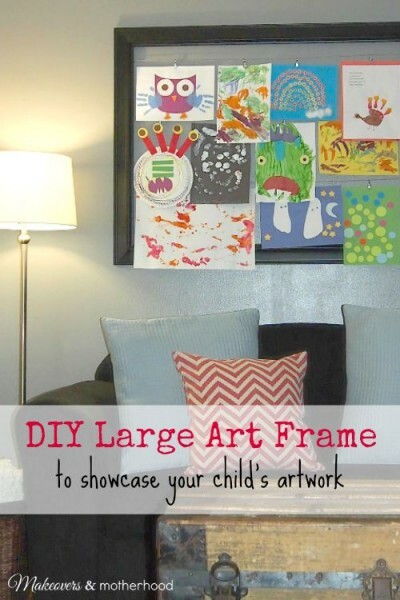 I love this idea because you can showcase a lot of art and it would look nice anywhere in the house! Pinning! This is a great way to display art!! Now, if only I can get my husband excited to help me with this ;). Thanks, Emma! It does hold alot of artwork… and of all different sizes. And you can overlap and layer pages (if there is extra “white” space around the border). It is so useful and fun… and adds some great color & personality to the room. The art projects are a combo of preschool and home projects and the boys are so proud to see their artwork displayed up there!